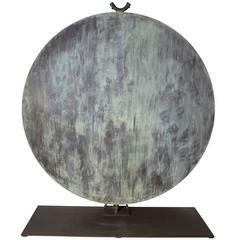 This "Fran All Till Fall" Midcentury Copper Fountain by Arne Jones, Sweden, 1957 is no longer available. From 1935 to 1944 Arne Jones worked in a stonemasonry. From 1941 to 1947 he studied sculpture in Sweden. He then studied in France (1947) and in Italy and England (1948). He participated in exhibitions in Paris during the Salon des Réalités Nouvelles of 1950 and 1951 and the Salon de Mai of 1952 and with Galerie Denise René in 1953 in Paris, New York, Hamburg and Brussels. 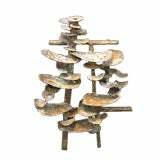 In 1959 he was invited to the Biënnale Middelheim in Antwerp, in 1961 for the Exposition international de la sculpture comtemporaine at the Musée Rodin in Paris and in 1963 for the exhibition La jeune sculpture again in the Musée Rodin . In 1968, Jones was represented with work in the Swedish pavilion during the Venice Biennale. From 1961 to 1971 Jones was a professor at the art academy of Stockholm. 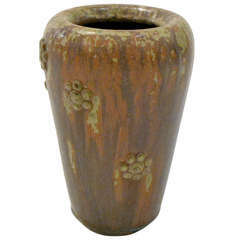 A wonderful and subtle bud vase by Arne Bang, the vase is adorned with small applied flowers and with a wonderful rusty orange glaze that crawls with hints of green. This is a very nice self contained French fountain made of aluminum. It has both a basin and a spout. Lead fountain by J.W. Fiske that features a small boy and girl underneath an umbrella, circa early 20th century.